The ShutterBee App for travellers has just been completely redesigned to let travellers now do a lot more with the app to keep track of their journeys and share them with the world. 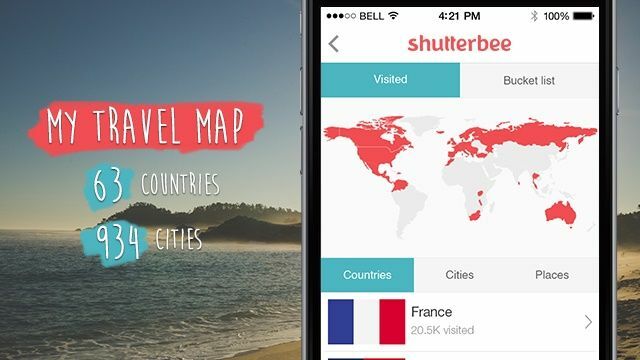 A free app for Apple iPhone from an Australian startup, ShutterBee serves as a travel journal and photo-sharing platform in one where users post photos from their past and current trips, share unusual travel experiences, create a personal travel map, keep a bucket list of places to visit and a lot more, the company says. Makers of the app say the 2016 update brings a complete redesign of the app’s interface, simplifying navigation and making it even more visually pleasing, adding that browsing through other users’ posts can be done via more ways, including searching by hashtags, sorting by most popular, latest or nearby. The new version 2.0 introduces the feature many users have been asking for: it now allows logging past trips even without uploading photos. Users can simply add countries, cities or places they have been to directly to their personal travel map by selecting them from a list, says ShutterBee. In addition, the new version responds to numerous user requests by making sharing past and current travel experiences simpler and more convenient. The introduction of a rating system lets users compare their travel experience level to others and get motivated to travel more. “Many users had reported the inability to add past trips as the only drawback preventing them from rating the app 5 stars,” says Anna Clark of ShutterBee. “We have listened and I’m really excited to announce that this feature has now been added. We believe ShutterBee version 2.0 is very close to being perfect and with feedback from our loyal users we will do our best to improve it even further and make it work great for everyone”, Clark adds. ShutterBee says its user-base is comprised of travelers from over 80 countries who they post photos from destinations that may be off the beaten track every day, making the app attractive for users who may not be able to travel a lot, but who get the chance to explore new destinations through other travelers’ eyes. The app is receiving positive feedback from reviewers online and offline.